Macrolide antibiotics are reported to modulate the production of cytokines in various type of cells. We examined the effect of macrolide antibiotics on inflammatory cytokines (IL-6 and IL-8) and chemical mediator (PGE2) and also matrix metalloproteinases (MMPs) productions by human gingival fibroblasts (HGFs) treated with lipopolysaccharide (LPS). The effect of macrolide antibiotics [erythromycin (EM), azithromycin (AZM) and josamycin (JOM)] on HGFs proliferation were examined by MTT assay. HGFs were treated with LPS from Porphyromonas gingivalis (PgLPS) and macrolide antibiotics, and IL-6, IL-8 and PGE2 levels were evaluated by ELISA. MMPs were detected by gelatin zymography. AZM slightly but significantly decreased HGFs proliferation, while EM and JOM did not affected. AZM increased PgLPS-induced IL-8 production dose-dependently, while AZM did not alter IL-6 and PGE2 productions. EM and JOM did not altered PgLPS-induced IL-6, IL-8 and PGE2 productions. All macrolide antibiotics did not alter MMPs production. These results indicate that macrolide antibiotics have no direct anti-inflammatory effect. However, the use of the inhibitors of cell signaling pathway failed to reveal the mechanism that AZM enhanced PgLPS-induced IL-8 production. These results suggest macrolide antibiotics have an indirect anti-inflammatory effect as a result of their antimicrobial properties. Because AZM increased LPS-induced IL-8 production by HGFs, the possibility is considered that neutrophils may be migrated to periodontal tissue and phagocytize the periodontopathic bacteria more efficiently. Caries and periodontal disease are two major oral diseases and are considered to be biofilm infections diseases . In particular, periodontal disease is highly prevalent and can affect most of the world population. Periodontal disease is accompanied by inflammation of the gingiva and destruction of periodontal tissues, leading to alveolar bone loss in severe clinical cases. To date, the effects of macrolide antibiotics on periodontal disease are examined in vitro and in vivo. Macrolide antibiotics are be classified into 14-, 15 and 16-membered ring. The representative drugs in their groups are erythromycin (EM), azithromycin (AZM) and josamycin (JOM), respectively. In particular, AZM has a good tissue penetration property [2–5] and inhibits biofilm formation made of Pseudomonas aeruginosa . We have reported that macrolide antibiotics, erythromycin (EM), azithromycin (AZM) and josamycin (JOM), inhibit biofilm formation made from Streptococcus gordonii and Porphyromonas gingivalis and that, EM and AZM, but not JOM, destroy formed biofilm in vitro . Moreover, our group reported that AMZ shortens the duration of treatment for aggressive periodontitis . Other than our reports, several groups showed the usefulness of AMZ for the treatment of periodontal disease in clinical and bacterial viewpoints [9–12]. These reports suggest that the combined application of macrolide antibiotics, in particular AMZ, is effective for periodontal disease. Recently, several reports showed that macrolide antibiotics modulate the production of inflammatory cytokine. AZM increase cytokines production in whole blood and alveolar macrophages  and bronchial epithelial cells . In contrast, AZM decreases cytokines production in endothelial cells , airway epithelial cell [16, 17] and smooth muscle cells  and plasma from LPS-treated mice . In particular, the latter phenomena mean that macrolide antibiotics have direct anti-inflammatory effect. Therefore, we consider the examination is interesting whether macrolide antibiotics modulate inflammatory response in periodontal disease. Human gingival fibroblasts (HGFs) are the most prominent cells in periodontal tissue. And HGFs produce inflammatory cytokines such as interleukin (IL)-6 and IL-8 and inflammatory chemical mediators such as prostaglandin E2 (PGE2) when HGFs were treated with lipopolysaccharide (LPS) [20–23]. Therefore, we regard this experimental system, in which HGFs were treated with LPS, as in vitro periodontal disease model. Moreover, because HGFs sustain to produce IL-6 and IL-8  and PGE2  in the presence of LPS, we consider that the examinations of effect on HGFs, as well as monocytes and macrophages, are important in the study on periodontal disease. Using this in vitro model, we examined the effect of macrolide antibiotics (EM, AZM and JOM) on LPS-induced IL-6, IL-8 and PGE2 production. Moreover, we examined the production of matrix metalloproteinases (MMPs) which play important roles in tissue degradation and periodontal disease. Erythromycin (EM), azithromycin (AZM) and josamycin (JOM) were obtained from Nihon SiberHegner (Tokyo, Japan), Pfeizer Japan (Tokyo, Japan) and Astellas Pharma (Tokyo, Japan), respectively. All antibiotics were dissolved in methanol at 100 mg/ml and added to culture media at final concentration of 0.1, 1 and 10 μg/ml. LPS from Porphyromonas gingivalis 381 (PgLPS) was provided by Drs. Tatsuji Nishihara and Nobuhiro Hanada (National Institutes of Public Health, Wako, Japan). PD98059 [mitogen-activated protein kinase kinase (MAPKK/MEK) inhibitor; Sigma, St. Louis, MO], SP600125 [c-Jun N-terminal kinase (JNK) inhibitor; Sigma], SB202190 (p38 MAPK inhibitor; Sigma), H-89 [protein kinase A (PKA) inhibitor; Sigma], wortmannin [phosphoinositide 3-kinase (PI3K) inhibitor; Sigma], U-73122 [phospholipase Cg (PLCγ) inhibitor; Sigma] were dissolved in dimethyl sulfoxide (DMSO). Pyrrolidin dithiocarbamate (PDTC) [nuclear factor-κB(NF-κB) inhibitor; Nacalai tesque, Kyoto, Japan] were dissolved in sterile water. HGFs were prepared as described previously . HGFs were maintained in Dulbecco's modified Eagle's medium (D-MEM, Sigma) containing 10% heat-inactivated fetal calf serum (FCS), 100 units/ml penicillin and 100 mg/ml streptomycin, at 37°C in a humidified atmosphere of 5% CO2. This study was approved by the Ethical Committee of our institution. Informed consent was obtained from each subject for the collection of HGFs. The numbers of cells were measured by MTT assay. In brief, the media were removed by aspiration and the cells were treated with 0.5 mg/ml dimethylthiazol-2-yl2,5-diphenyltetrazolium bromide (MTT, Sigma) in culture mediumfor 4 hat 37°C. After washed with PBS once, isopropanol/ 0.04 M HCl was added and optical density (OD570) were measured using microplate reader (Model 550; Bio-Rad, Hercules, CA). HGFs (10,000 cells/well) were seeded in 96-well plates (AGC Techno Glass Co., Chiba, Japan) and incubated in serum-containing medium at 37°C overnight. Then, the cells were treated with various concentrations of antibiotics (0, 0.1, 1 and 10 μg/ml) in the absence or presence of PgLPS (10 ng/ml) for 24 h (200 μl per each well). In the experimental using inhibitors of cell signaling were used, the cells were pretreated with PD98059 (20 μM), SP600125 (20 μM), SB202190 (20 μM), H-89 (10 μM), wortmannin (20 nM), U-73122 (2 μM) or equal volume of DMSO (control) for 60 min, followed by treatment with the combination of PgLPS, (0 or 10 ng/ml), AZM (10 μM) and each inhibitor (the same concentration as pretreatment) for 24 h. Using PDTC (100 μM), the equal volume of sterile water (1/500 volume) were added as a control. The numbers of cells were measured using MTT assay. The concentrations of IL-6, IL-8 and prostaglandin E2 (PGE2) in the culture supernatants were measured by ELISA according to the manufactures' instructions (IL-6 and IL-8, Biosource International Inc., Camarillo, CA; PGE2, CaymanChemical, Ann Anbor, MI), and were adjusted by the number of remaining cells. Cell culture supernatants as above were subjected to gelatin (for MMP-2 and MMP-9) or casein (for MM-1 and MMP-3) zymography according to the method described previously [27, 28]. Cell supernatants (10 μl) were mixed with 3 × sample buffer [150 mM Tris-HCl (pH6.8), 6% SDS, 30% glycerol and 1% bromophenol blue] and fractionated in 10% polyacrylamide gel containing 0.1% gelatin or casein under non-reducing conditions at 4°C. The gel was shaken in 10 mM Tris-HCl, pH7.5, 2.5% Triton X-100 at room temperature for 30 min twice to remove SDS. Then the gel was shaken in 50 mM Tris-HCl (pH7.5) for 10 min at room temperature, followed by shaking gently in 20 mM Tris-HCl (pH7.5), 200 mM NaCl, 5 mM CaCl2, 0.02% sodium azide] at 37°C for 20 h. The gel was fixed in 50% methanol and 10% acetic acid, stained with coomasie brilliant blue R-250 and destained. Data are presented as means ± standard deviation (SD). Differences between control group and experimental groups were evaluated by Dunnett method (Figure 1). Differences between groups were evaluated by the pairwise comparison test corrected with Holm method (4 null hypotheses, without PgLPS vs. with PgLPS; 3+3 null hypotheses without antibiotics vs. with 0.1, 1 and 10 μg/ml of antibiotics in the absence or presence of PgLPS; total 10 null hypotheses, Figure 2). All computations were performed with the statistical program R . Values with P <0.05 were considered as significantly different. The effect of macrolide antibiotics on HGFs proliferation. HGFs were plated in 96-well microplate at 2,000 cells/well and were added the media containing macrolide antibiotics (0, 0.1, 1 and 10 μg/ml). MTT assay was performed at day 0, 3 and 7 days. **P < 0.01 (Dunnett method). The effects of macrolide antibiotics on the production of IL-6, IL-8 and PGE 2 . HGFs were treated with the combinations with PgLPS (0 and 10 ng/ml) and macrolide antibiotics (0, 0.1, 1 and 10 μg/ml) for 24 h, and the concentrations of IL-6 (A), IL-8 (B) and PGE2 (C) were measured by ELISA. The concentrations were adjusted by the cell numbers and expressed as per 10,000 cells. *P < 0.05, **P < 0.01 (pairwise comparison corrected with Holm method, 10 null hypotheses). Open bars, treatment without PgLPS; closed bars, treatment with 10 ng/ml of PgLPS. First, we examined the effect of macrolide antibiotics on HGFs proliferation. The concentrations of macrolide antibiotics were determined based on the clinical report that AZM concentration in periodontal tissue with the usual use of AMZ (500 mg/day for 3 days) are 2-3 μg/g tissue . At day 3, any antibiotics in all concentration showed no effect on HGFs proliferation. At day 7, EM and JOM showed no effect on HGFs proliferation at up to 10 μg/ml. AZM also showed no effect on HGFs proliferation at up to 1 μg/ml but suppressed slightly, but significantly, HGFs proliferation at 10 μg/ml (Figure 1). We examined the effects of antibiotics in in vitro periodontal disease model. When HGFs were treated with PgLPS and macrolide antibiotics for 24 h, the viability of HGFs were hardly affected by MTT assay (data not shown). The concentrations of IL-6, IL-8 and PGE2 were measured and adjusted by the results of MTT assay. In the absence of PgLPS, all macrolide antibiotics did not affect IL-6, IL-8 and PGE2 production (Figure 2). When HGFs were treated with 10 ng/ml of PgLPS, HGFs produced large amount of IL-6, IL-8 and PGE2. EM and JOM at upto10 mg/ml did not affected LPS-induced IL-6 and PGE2 production (Figure 2A and 2C). However, AZM increased LPS-induced IL-8 production in a dose-dependent manner (Figure 2B). Similar results were obtained using human skin fibroblast TIG-103 cells (data not shown). These results indicate that AZM, but not EM and JOM, affects only IL-8 production by HGFs. Next, we examined the effect of macrolide antibiotics on MMPs production by HGFs. When HGFs were treated with the combination with PgLPS (0 and 10 ng/ml) and macrolide antibiotics (0, 0.1, 1 and 10 μg/ml), the bands of proMMP-2 and active MMP-2 were very similar (Figure 3). No bands of MMP-1, MMP 3 and MMP-9 were observed in HGFs (data not shown). These results indicated that PgLPS and macrolide antibiotics do not affect MMPs production. The effects of macrolide antibiotics on MMPs. HGFs were treated with the combinations with PgLPS (0 and 10 ng/ml) and AZM (0, 0.1, 1 and 10 μg/ml) for 24 h, and the cell supernatants were subjected to gelatin zymography. At last, we examined what signal pathway AZM activates using cell signaling inhibitors of MEK/ERK (PD98059), JNK (SP600125), p38 MAPK (SB202190), NF-κB (PDTC), PKA (H-89), PI3K (wortmannin) and PLCγ (U-73122). If AZM increases IL-8 production by the activation of these cell signalings, their inhibitors will abolish its increased IL-8 production. Namely, it is predicted that when HGFs were treated with these inhibitors, IL-8 level from PgLPS+AZMtreated cells is equal to that from PgLPS-treated cells. In DMSO-treated cells (control), AMZ increased PgLPS-induced IL-8 production approximately 1.4 fold (Figure 4A). When HGFs were treated with PD98059, IL-8 levels are almost equal to control in PgLPS-or PgLPS+AZM-treated cells (Figure 4A). When HGFs were treated with SP600125, PgLPS-induced IL-8 production was increased compared with control and PgLPS+AZM-induced IL-8 production was slightly increased (Figure 4A). When HGFs were treated with SB202190, both PgLPS-and PgLPS+AZM-induced IL-8 productions were decreased. However, the ratio of IL-8 level treated with PgLPS+AZM to that with AZM ratio is approximately 1.4 and quite equal to that in control (Figure 4A). When HGFs were treated with H-89, PgLPS-induced IL-8 production was de creased and PgLPS+AZM-induced one was slightly decreased compared to their controls (Figure 4B). When HGFs were treated with wortmannin or U-73122, PgLPS-induced IL-8 production was decreased but PgLPS+AZM-induced one was nearly equal to control (Figure 4B). When HGFs were treated with PDTC, no IL-8 production was observed (Figure 4C). These results indicate that all inhibitors we examined did not fulfill the prediction. 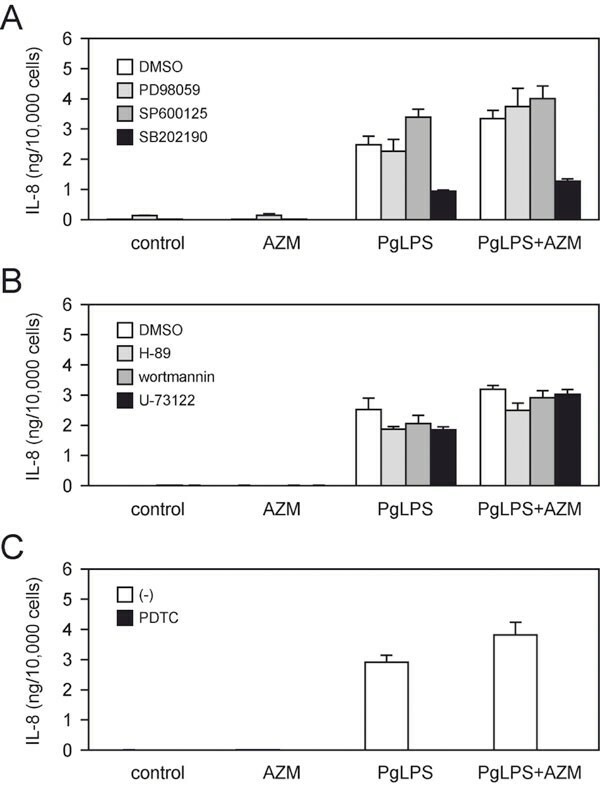 The effects of cell signaling inhibitors on PgLPS-and PgLPS+AZM-induced IL-8 production. HGFs were pretreated with inhibitors, and treated with the combination of PgLPS (0 and 10 ng/ml), AZM (0 and 10 μg/ml) and each inhibitor. IL-8 levels were measured by ELISA. The concentrations were adjusted by the cell numbers and expressed as per 10,000 cells. (A) PD98059 (20 μM), SP600125 (20 μM) and SB202190 (20 μM); (B) H-89 (10 μM), wortmannin (20 nM) and U-73122 (2 μM); (C) PDTC (100 μM). LPS-treated HGFs produce inflammatory cytokines such as IL-6 and IL-8 and inflammatory chemical mediators such as PGE2 [20–23]. IL-6, IL-8 and PGE2 play important roles in inflammatory responses and tissue degradation. IL-6 has the ability to induce osteoclastogenesis [20, 31]. IL-8 acts as a chemoattractant for neutrophils  that produce proteases such as cathepsin, elastase or MMP-8, leading to tissue degradation. PGE2 has several functions in vasodilation and the enhancement of vascular permeability and pain, the induction of osteoclastogenesis, and is believed to play important roles in inflammatory response and alveolar bone resorption in periodontal disease . Therefore, we examined the effects of macrolide antibiotics on IL-6, IL-8 and PGE2 production. Our data indicate that macrolides antibiotics did not decrease LPS-induced IL-6, IL-8 and PGE2 productions by HGFs. Rather, AZM increased IL-8 production. Also macrolide antibiotics did not altered MMPs production. These results suggest that macrolide antibiotics do not have a direct anti-inflammatory effect. On the other hand, macrolide antibiotics show an antibacterial effect per se. We have reported that EM and AZM, but not JOM, destroy in vitro biofilm formed by Streptococcus gordonii and Porphyromonas gingivalis . Therefore, macrolide antibiotics, in particular EM and AZM, have an indirect anti-inflammatory effect in periodontal disease as a result of antimicrobial properties. These findings are consistent with the previous report that AZM decreased bacteria-infected IL-6 production by hepatocyte HepG2 cells but did not affected IL-1β-induced IL-6 production, indicating antimicrobial properties of AZM but not a direct anti-inflammatory effect . As well as this report , AZM did not decrease cytokine productions by HGFs. Rather, AMZ increased LPS-induced IL-8 production. Moreover, AZM increased LPS-induced IL-8 production in human skin fibroblast TIG-103 cells (data not shown). Therefore, the increase of IL-8 production by AZM may be the property of fibroblasts. The reason why AZM increases LPS-induced IL-8 production by HGFs is still unclear. It is reported that macrolide antibiotics activate MEK/ERK pathway and increases IL-8 production in bronchial epithelial cells . However, it is unlikely that AZM activates MEK/ERK in HGFs, because its inhibitor PD98059 fails to abolish the increased IL-8 production by AZM in LPS-treated HGFs. For the similar reason, it is unlikely that AZM activates JNK, PKA, PI3K and PLCγ. Moreover, it is unlikely that AZM activates p38 MAPK because the ratio of IL-8 level treated with PgLPS+AZM to that with AZM ratio in SB202190 (p38 MAPK inhibitor)-treated cells is quite similar to that in control, indicating that p38 MAPK inhibitor also fails to abolish the increased IL-8 production by AZM. Because inhibition of NF-κB suppressed IL-8 production to basal level, the effect of AZM treatment on NF-κB pathway remains unknown. AMZ may activate NF-κB signaling. AZM increases IL-8 production in HGFs and whole blood and macrophage , while AZM decreases in endothelial cells  and smooth muscle cells . Because HGFs are most abundant in periodontal tissue and produce large amounts of IL-8, we consider that the overall IL-8 level increases by AZM administration. Therefore, neutrophils may migrate into periodontal tissue and release the proteases (such as cathepsin, elastase and MMP-8). As a result of these events, inflammatory responses may exacerbate transiently. However, because neutrophils infiltrated into periodontal tissue phagocytize and decrease periodontopathic bacteria, the inflammatory response in periodontal tissue may cease rapidly. However, initial preparation such as scaling and root planing is indispensable for the treatment of periodontal disease. Because periodontopathic bacteria are present in periodontal pockets (i.e. outside of the body) as a biofilm, hosts cannot exclude the biofilm by fibrous encapsulation and phagocytosis by neutrophils may be limited. Therefore, biofilm in periodontal pockets does not disappear unless dentists removed the biofilm artificially and physically. In the cases that biofilm or, if bacteria are killed, extracellular components of bacteria such as LPS and peptidoglycan remain in periodontal pocket, AZM administration may result in increased IL-8 production and the exacerbation of inflammation. Our results indicated only AMZ suppressed HGFs proliferation slightly in high concentration. However, this precise mechanism remains unknown although it is possible that the difference of structure among these antibiotics leads to these results. Nevertheless, we believe that suppression of HGFs proliferation by AZM yields little problem because the long-term administration of AMZ is rare for the treatment of periodontal disease. In summary, we demonstrated that macrolide antibiotics did not decrease LPS-induced IL-6, IL-8 and PGE2 production by HGFs. Rather, AZM increased LPS-induced IL-8 production. These results suggest that macrolide antibiotics show no direct anti-inflammatory effect in periodontal disease, i.e. an indirect anti-inflammatory effect mediated by their antimicrobial properties. A Kamemoto, T Ara contributed equally to this work. We thank Drs. Tatsuji Nishihara and Nobuhiro Hanada for providing Porphyromonas gingivalis LPS. We also thank Associate Prof. Takashi Uematsu (Department of Oral and Maxillofacial Surgery) for HGFs preparation and Keiko Fujii for technical assistance. The study was supported by a Grant-in-Aid for Scientific Research from the Ministry of Education, Science, Sports (Code No. 18791390) and Culture of Japan and a Scientific Research Special Grant from Matsumoto Dental University.